About 40 minutes Northwest of Concord, NH, Mt. Kearsarge rises above the landscape. 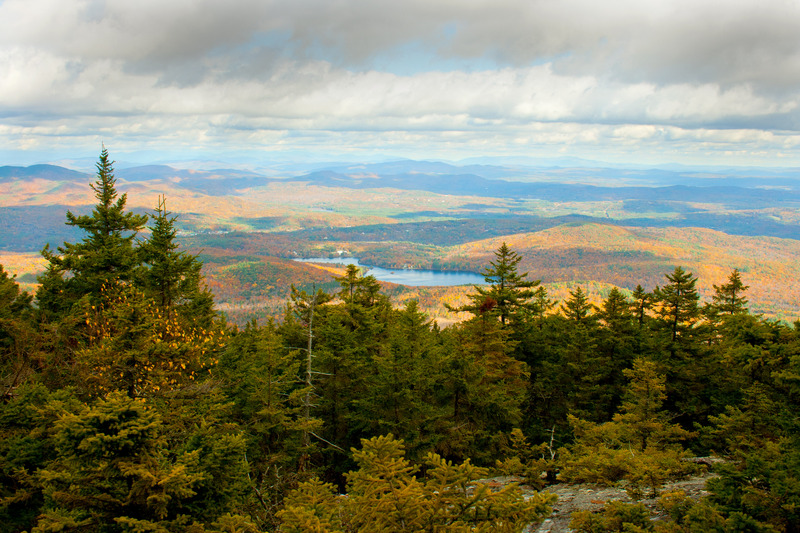 At 2,937 feet, it is far shorter than many of New Hampshire’s other peaks. However, it’s beauty and that of the surrounding landscape is worth a visit. When family came to visit in October, we decided Kearsarge’s location was ideal for a quick hike during the kid’s school day. It took about an hour to get there from Manchester and because it was off season, we had the trails mostly to ourselves. Two state parks grace the slopes of the bare-summitted mountain – Winslow and Rollins. While there is hiking from both locations, we decided we wanted to try the Class-2 Barlow Trail out of Winslow State Park, which is on the northern side of the peak. The Barlow Trail begins at the Winslow parking area, which sits at 1,820 feet above sea level. I was impressed to find it has a playground, picnic area, bathrooms and scenic views to the North. It’s really a picturesque little area. Starting from the lot, the Barlow Trail heads into the woods immediately. While there is no major climbing over the 1.8 mile trail, only about 1100 feet in total, there is plenty of technical, rutty, rocky trail to cover and you should use caution if the conditions are wet, which they were when we went. The landscape surrounding Mt. Kearsarge is especially lovely in the Fall. At the beginning of the hike we meandered through a forest of deciduous trees. But as we climbed towards the summit, I noticed the growth slowly shifting to mosses, lichens and evergreens. At one point everything had this sort of green hue from the pine trees above and the lichens below. As the elevation continues to increase, the trees thin out and the mountain offers several beautiful vistas to the north. Eventually, the growth peters out to a just few small patches of trees on the nearly-naked summit. It was quite windy and chilly by the time we got to the summit, so we paused only long enough to snap a photo, but the summit would be a great place to pend some time soaking in the views. Adorned only by a cell and fire tower, the summit provides sweeping views of the surrounding countryside and on a clear day you can see Boston. Unfortunately, the day we went it was partly cloudy and we couldn’t see that far. After a few brief moments, we turned and headed back down the Barlow Trail to the parking lot. Mt. Kearsarge was a great hike that could be done any time of the year. I recommend off-season or mid-week hiking to avoid the high volume of hikers that I’m sure descend on the mountain, especially in the summer. If you go, plan on two bottles of water up and two back. It is windy and chilly at the top so bring a windbreaker and your camera as you are going to want to stay awhile and take pictures. Great advice! I want to take my kids back next year when the weather gets a little nicer. It’s a great hike for kids to really cut their teeth on hiking – not too long, but not too easy either.